I’ve written and spoken extensively about branding. I don’t consider myself to be a branding expert by any stretch, but as I’ve worked to build branding for Xanadu Gallery and RedDotBlog.com, I’ve learned quite a bit about the branding process. I’ve also learned how important branding can be when you are creating a relationship with art buyers. Should an artist use his or her own name when building a brand, or is it a good idea to create a business name and brand around that name instead? The most common form of the question I hear is whether it’s okay to use the artist’s studio name instead of just using the artist’s name. I can understand where the question is coming from. There is something very alluring about creating a business name and using it for branding purposes. I remember the excitement my wife and I felt when, in 2001, we decided to open a gallery. It was a lot of fun thinking about how the gallery would be organized and how we would try to make it different from other galleries. We thought about the type of artwork we would carry, the location, the layout of the gallery and about a million other things you have to think about when you are opening a new business. We distilled all of these thoughts into a business plan and began working toward getting the gallery off the ground. At some point, we decided it was time to come up with a name for the gallery, and, surprisingly, the naming process turned out to be one of the most agonizing parts of the whole launch process. A name is so important, and once you select a name and have signs and letterhead made, you are pretty much stuck with it. Naming is something you definitely want to get right. I remember spending days brainstorming about names. We first thought about what we didn’t want use. We decided using our name or last name, as some galleries do, wasn’t going to work. My last name, Horejs, is both unpronounceable if read, and unspellable if heard. With that out of the way, we started thinking about everything else we might call the gallery. We must have come up with hundreds of names, and sorting through all of them was a real chore. Finally we landed on one that we thought was perfect. It distilled into a single word exactly what we wanted to convey through our gallery name: “Quintessence”. “Quintessence Gallery.” It had, we thought, a nice ring to it. We asked our attorney to register the name with the state corporation commission. By some cosmic coincidence, someone had registered the exact name several weeks earlier. What are the chances that we would have thought of the same name for a gallery at almost exactly the same time someone else? Of course, now, I am very happy that we didn’t end up with the name – it doesn’t sound nearly as good in retrospect as it did at the time and can you imagine how expensive a sign with 19 letters would be!? Now we had to go back to our list of names and try again. 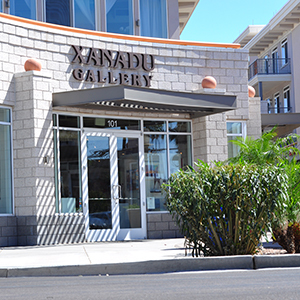 I wish there was a great story about the flash of inspiration that lead us to Xanadu Gallery, but the truth is my mother-in-law saw the word “Xanadu” on a personalized license plate and said, “how about ‘Xanadu!? '” The name stuck. Once we had a name we got to work on logo design, stationery, business cards, and our website. It was a lot of fun, and building Xanadu’s brand has been an undertaking of love ever since. Should you Use your Name or a Business Name? In spite of this, I’m going to strongly recommend that you build your branding around your name, rather than around a studio name. Unlike other businesses, as an artist, you are your brand. When collectors see your work, they are going to feel a connection to you, the artist, even if they have never met you. Art is a pure form of communication – your vision is going through the viewer’s eyeballs, straight into his brain, and is going to stir an emotion. The connection is going to feel very personal, and that collector is going to want know your name, not your business name. Art is one of the last things a human being can buy that hasn’t been engineered by a marketing committee and mass-produced in a factory. Using your name is going to help convey this message. Because you are your brand, I recommend keeping the spotlight on yourself. Use your name on your cards, your brochures and your portfolio. Try to get a website URL that includes your name. The more your buyers see your name, the more they’re going to remember you. Can you create a business name to use in addition to your studio name? Sure! There’s no reason you can’t have your cake and eat it too. I would recommend that you use the studio or business name in subordination to your name. You could include it below your name in your marketing materials, as a kind of subtitle. There may be reasons that you would want to disregard this advice. If you aren’t focused on creating one-of-a-kind works and have a production studio set up where employees are helping you crank out work, a studio name may make more sense. This is especially true if the business might one day be sold to someone else. Another exception to the rule would be if your name is impossibly long or complex. Even then, I would suggest thinking about changing your name or creating a pseudonym around which you can build your brand. Do you have a studio name you use instead of your given name in marketing? What made you decide to do so. Did you think about using a business name for marketing and then decide not to? Why? Share your experiences, thoughts, opinions and random ramblings in the comments below! What if your name is so common, other artists with the same name, living nearby have used it longer than you? I’m not making this up. In high school, my 3rd cousin and I had the same name. Years later when I had to divest my father’s property, we opened a local bank account so the bank ended up with 2 of us (he stayed in the hometown). In art school at a university, there were 6 of us with 2 of us in the art school. 4 of the 6 used the same spelling of the first name. 2 of those had the same middle initial (luckily not in the same schools). Currently there are 2 of us as working artists- about 90 miles apart. I’m considering strongly the studio name because it connects me to my roots and is distinctive. Ant and all opinions are valued. Lol! So true! I loved Jason’s advice and wisdom, which makes a lot of sense, and in addition, I too have a common name and a long name, which I attempted to shorten to E.Rose… After signing my paintings as “E.Rose” for years, I realized I had another problem… A crop of artists and photographers were also signing their work in that way from not only Elizabeth Rose, but variations of names like Erin Rose. I started to go with the Elizabeth Rosinski version but even that is too common. I made a decision to break the rules and go with the long name Elizabeth Rose Rosinski, even though I do still sign the front of my paintings w ERose. My email newsletter is titled “(month) News from Rose Cottage Studio”. I like that name because it conjures up a pleasant, traditional and intimate image, also because my studio is two rooms in my modest home. I don’t use that on my card or website though, and I’m glad, because my work, while still classic and traditional is now heading into a slightly more modern feel, with a square format and clean, narrow gallery frames that are deep. Read this too late. I just began selling my art last year, and my website, fb page, email, everything is under my studio name. Now what? Wouldn’t it be worse to go back and start over? How can I salvage this? letterhead, business cards, website, etc. and keep creating art. It’s not a fast-track solution, but it can be every bit as good over time if you’re consistent. For example, if I were using my studio name, it would read: Moonhawk Studios (in larger print), then Kate Aubrey, Artist (in smaller print). Good luck! Thanks so much, Kate! That sounds like the perfect solution! My studio name is Wild Wind Studios (I’m at the top of a hill with wind that rattles my studio). I’m thinking now perhaps I should have my name first??? Is it too long? Debbie Gardner at Wild Wind Studios? I’m not big, may be I should change it altogether. I have used Art By Raschella since the 80s. It’s my last name, and unisex, although it does lean towards feminine. My website can be reached at raschella.com or artbyraschella. com. It’s worked out well and just seemed like a natural. I actually love coming up with creative names…my dogs are evidence of that! My name, Roxanne Rodwell, which I began to call my painting name, came to me rather accidentaly. When I moved to New Mexico where no one knew me, I introduced myself as Roxie Rodwell, my legal name. Many thought it was a “nick-name”. I didn’t correct them as I rather liked Roxanne. But Roxie being my legal name had to be kept for obvious reasons but in New Mexico I became Roxanne. Everything related to art is signed as Roxanne Rodwell and I thank that wonderful state, especially for art, for a name which I think is rather distinctive. Anyone who calls me Roxanne I know is from New Mexico or it could be someone who is familiar with my art. When I decided to go professional, the name for my art business came easily. My blog is also under that name, Paint a Masterpiece and it is a goal I always strive for. However, it’s interesting that people seem to know my artist name and my work, not PAM. After 8 years as a professional, a large presence in local exhibitions and galleries, as well as nearly 2,000 blogs and many art volunteer hours, I suppose your name does get out there. I’ve recently bumped into several people in non art related activities that knew my name and asked if I was ‘the artist’. So perhaps a name isnt as important as the ammount of effort you put into getting it out there. I heard once in a class that you should use your name to bring people to your art, website etc. So I changed my Facebook name, my Redbubble site name, my website name etc. because although “Wolf Eyes Art” is cool to me, it was hard to get even friends and family to remember it even with a business card! They wanted to type in my name and be done with it!. I also added another Instagram page based on my name. I make sure that these sites are for my art, art newsletter, and art related items, nothing political or too personal (unless it is about me and my art process,etc.). It also eliminates the problem of remembering my usernames etc. Now if I can get some more people to sign up for my newsletter/blog! Unspellable plus unpronounceable = memorable. You’d have gotten away with it . . . I never once considered using a studio name other than my given name. For me though it makes perfect sense to use my given name. I do paintings of vintage automobiles and was blessed with Nash as a first name. The fact that I am seemingly named after an early American automobile is often a pivotal point in conversation and helps to not only remind people my name but also what I do. Jason, I’ve been following your Red Dot Blog for several years now. This particular article got my attention. Having spent 26 years as a graphic designer and art director, I am very much aware of how vital effective branding is to the success of any business venture. I agree with you on most of your article and your points are well made. I have your book “Starving to Successful“ and both my wife (and agent/manager) Diane refer to it often! When I made the break into painting full time a little over three years ago, my artist signature was one of a couple considerations which reigned uppermost in my mind. I am Austrian by birth (I am fully bilingual, German and Englisch), and have always had a deep awareness and appreciation for my family’s history which reaches back (as far as we know) into the late 1200s. My own father, though a industrial engineer by profession, was very creative and artistic and I grew up watching him draw and paint. His father (and uncles) before him, grandfathers, and great grandfathers also had incredibly creative streaks. Cognizant of all that, it hit me one night that I should use the original, ancient family name as my signature, not so much to stand out (OK, that too!) but more to acknowledge and pay tribute to ancestors whose product I am. My full name is Günther Johannes Haidenthaller. A bit long for a business name. The first ancestor we have record of was Ulreich der Erste (the First) von Haiderthal, and there have been von Haiderthals, von Haidenthals and Haidenthal(l)ers since that record of a business transaction dated 1320…which puts Ulreichs birthdate around 1280-1290. I feel that when I sign my art, I am paying tribute to over seven centuries of Haidenthaller creativity. (If you’re ever interested, I can share with you a fascinating story of one Maximillian Haidenthaller von Haidenthal, a Salzburger who spent a significant part of his life as a guerilla fighter behind enemy lines during the Turkish war and sieges in the mid 1600s, and was awarded knighthood and a family crest by Kaiser Leopold in 1686 for services rendered to the crown. We found it in the National Archives in Wien/Vienna.) I have been using “von Haiderthal Fine Art“ as my business name and signature on my art since I began this venture, and it is similar enough to my actual last name that it has been an effective and memorable attention getter rather than a detrimental point of confusion. If you ever have a few minutes and the inclination, take a look at my art on my website. Any feedback is appreciated but certainly not expected. Have a wonderful, successful and happy day! I’ve had a graphic design business for over 30 years: Debbie K Graphics. My last name is long and difficult to spell and many of customers only know me as Debbie K! I even ran for a local office as Deborah “Deb K” Kardaseski. Now that I’m semi-retired and have more time to focus on my art, I’ve taken the name of Spotted Dog Designs (named after a much-loved dog who passed years ago). I went with a studio name because, in addition to my pen-and-ink/colored pencil drawings, I produce handmade invitations, and sell my photography. I’ve always been torn between using my name vs. Spotted Dog. I’m still not sure what to do. Any comments/suggestions would be most welcome! I’ve had many “art” names over the past decades, all because of changing names from maiden to three different marriages. (>ugh!<). It was during my second marriage that my name became known within the art circles and shows in which I participated in the mid-Atlantic region during the '90s. Carter was my last name at that time, and I built up a following. When my husband died, I continued using Jean Carter as my art name for 12 more years until I remarried. With my last (and current) marriage, I had my legal name revert back to my maiden name as middle name rather than Carter, but since I had become known as Jean Carter, I elected to use Jean Carter Kimble as my art name, even though my legal name is now Jean Anderson Kimble. My husband and I discussed at length as to whether I should keep Jean Carter as my professional name, but I wanted to honor him as my husband, so decided on incorporating both names. The thought behind this was that people would see the "Jean Carter" part and figure out it was me. Since I was inactive in art for about 10 years for various reasons, everyone forgot about me anyway. Now I am back in the field trying to build up my art career again, and using Jean Carter Kimble. Since I'm doing the best work I've ever done, and branding my work in several different ways other than just name, such as how I frame work, as well as style and materials. I have a totally fresh clean slate to put it all out there. HARD! I've learned a lot over the years since I first started out in 1983! Since then, I've written and published a book, THE RICH, THE POOR, AND THE NAKED, also incorporated into my website and other art internet sites. You can find me at http://www.jeancarterkimbleart.com, Facebook at Jean Carter Kimble Art, and Instagram at jean_kimble_art. Jean, that’s a good example of the female dilema. We have a name that doesn’t stay the same. I think you have found a reasonable solution for yourself. Jean, I so relate to what you’re saying. I still have my 2nd married name although I am divorced. I never went back to my maiden, drats! Now, I go by it with my married legal name in parentheses. It feels totally messy! Many Interesting replies . I alwys used my name for my studio , even at the time I was a amature painter, because , my family was known in the city we lived in . I have been painting and teaching since the age of 25, so because of my name , people had trusted to leave their teens to learn art at my studio. But now its been 28 years that I reside in NewZealand , but I still have all my logo , email , B-Card, Pamphlet, flyers, website , all are on my name, and it makes it easier to be recognized and be found, which my name is different to english name too. Even my old students find me online and send me messeges and interesting to know several of them are abroad and followed thier art., Its so rewarding to hear that. My name is Shyamal Raguso. Love my last name but no one could remember let alone say my first name correctly so I decided to shorten it or change it completely. There were too many options. But one day my husband just started calling me Shy. Then others followed and it stuck. So, I decided to use it. Shy Raguso. Sounded good, even though the word shy might not have the best meaning. But I have decided to go for it and it has worked out. Love to hear your comments. Thank you. I do use my own name on the fine art website, RosemarieAdcock.com, where I show original paintings. My company name, Chapel Galleries, has its own website and is set up for reproductions and licensed items, needed especially this past year after I signed an international contract with Springbok puzzles. We use proceeds from reproductions for our humanitarian projects through our 501c3 organization. I really needed a distinct name for the Chapel Galleries line, and fine art is so very different than the other, I felt I had to keep them separate, but also maintain both. The clientele is also totally different from collectors who purchase original work. My parents gave me the name Frances after my great grandmother whose picture I carry in my wallet to this day. But when I was barely two weeks old my father suggested I looked like Pookie the rabbit from the books by Ivy Wallace. Well, the name stuck, and that was it, I was Pookie by all my friends and family. There are times in my life when I use Frances but when I tell people I’m mostly called Pookie it’s very hard to switch. So I’ve had this conundrum since I was very little. When I began doing textile designs with cassava, wax and dyes I always signed the pieces I made with Pookie in the bottom corner. Later, I began working in metal making woven jewelry, and was about to get my work photographed for a show, and a gallery when I realized I had no idea what name I would use. By then I had a married name, and the photographer thought my work suited the name Frances, it was more elegant. However, I knew I was going to go with Pookie because it was me, and in memory of my father. I choose my maiden name, even though it is long. I use Pookie Weatherburn on my website and my business cards. I have also registered in Weatherburn Designs. Names are very personal, and I think it’s a struggle to decide, but I feel it’s best to go with what you feel comfortable with. I love Pookie! That has been my baby sister’s nick-name for more than 50 years. A few years ago as a nascent (oil painting) artist and one who was interested in exploring the non-perfectionist side of myself, I chose the name Loosey Goosey Artist for my business. Although some folks in the art community thought it wasn’t professional enough, I didn’t really care. I have since grown into that moniker and it fits me and my business just fine. It all depends on what it is that you are wanting to do. I am having such fun in my life! I’m sort of doing both – at the prompting of a friend I started a blog from which I am building my army. The website, my online store, and my business cards all read Debnation – like damnation but with more me, I say. I came to this decision after researching how many people have my actual name, Debora Ewing, and how they spell it, and what they do – there are several writers and a serious sea-diver. I also gave serious thought to art history and my background in marketing. I type my name with a lower-case D because I like how it looks, and with an accent aigu over the E so nobody uses the proper Hebrew pronunciation. Of course I may revise any of this in the future. For writing I use my full name, debora Ewing, and art is either signed DCE and the year of completion or DEwing, because I think it’s fun to pre-emptively confound the verification experts who will have to determine which paintings are authentic. My father was Polish but orphaned at such a young age, he never inherited any of the culture. I used my maiden name and when I got married I tacked my husband’s name on. Over the years, people just would skip over my long middle Polish name, so now I use Jan Crooker. It is easier for people to remember. My problem almost fits the second exception, “if your name is impossibly long or complex”. It is neither impossibly long nor complex, but it does get confused in the spelling and people constantly misspell it even when I show them my driver’s license with it spelled properly. Even when I google it I am sometimes asked “Do you mean “Tomas”? Uuuuuugggghh! I sometimes wonder if I miss out on views of my artwork and therefore sales because people are looking for Bill TOMAS not Bill TOMSA. I wonder who else has this problem and how have they handled it. Just finished reading & scanning so many remarks on branding and names. Can truly relate to Jean Carter Kimble as I kept my ‘married’ name Suzan Noyes regardless of other connections. I go by the name and so does my website. I’ve been around a bit so I’ve decent standing online for bot-fishing, anyway, ha. Personally, I feel if you’ve got your sig on a piece of work that’s who you should be known by. Confess to loving Weatherburn Designs – so classy. But my wild side likes Loosey Goosey because I am perverse and blame “Alice in Wonderland” for that. My last name is Drawbaugh — a real fluke, since it was acquired through marriage. I figured that it’s a natural connection to my business as an illustrator, so I named my company Susan Drawbaugh Studio with a tiny heart above and slightly between the Draw & the baugh. People remember it – and are struck by its relatability. Heard this same advice years ago from another marketing professional, for all the same reasons. At the time, I hadn’t really given any thought to “marketing” myself or my art. I know several of the other artists at the seminar started slowly changing over their branding from their studio name to include their personal name. I quickly grabbed on to “Tryon Sculpture Arts”, registered the domain name, hired a designer friend to help me with the business cards. I still need to create a nice banner to put up when I do art shows, but getting there. Funny how little things matter. I’ve always worn a classic black French beret, and now it’s one of the first things people recognize when they see me at a show. I haven’t read all these replies, so sorry if this repeats. I went with a business name, “Lundeen Artwork”, because my name, Carol Lundeen, is also the name of a very successful photographer. I am an oil painter. I have had this name for 20 years. Do I still need to rethink this? JosePardo.com was (and is still taken) when I set up my website, so I went with PardoStudio.us, I also purchased .com and check on the availability of JosePardo.com periodically. But while I would purchase it, I’m not sure I would necessarily change my website at this point? Oh, I love the poetry of Pardo Studio! Do it! Then I set aside sewing for other people and got into custom stained glass. “Davidson Originals” works for that, too. So–the pretty pictures at davidsonoriginals.com constitute my portfolio; there’s nothing for sale there. All my stained glass is custom. This subject is a good conversation starter, thank you. I love all the comments about choosing a name since it can be a very daunting process. I have been a professional silk artist since 1995 and since then have had some name changes. For the past 18 years I have used my two middle names Lisa Archer. Unfortunately my first name Georgine was taken when researching a name for my website. My logo along with the name of my studio Lisa Archer Silks carries through with my designs and style of painting on silk. My very first paid advertising for my work was in the Yellow pages over 30 years ago and the sales rep warned me firmly. Put your name in your business title, and be proud of it. He said that as an artist using your full name is a very professional thing to do and studio names tended to look a bit distracting and sometimes do not adequately convey what you do. He also recommended that the word art be in it so that searching would be easy (this was before full internet days). I have never used my first name as I do feel it is a bit too long, but wadsworth smith art has worked well for me and shows up in the art searches as well. In my bios and statements etc, I just spell my full name Sharon Wadsworth Smith. I think there’s some great advice here, Jason! I do business consulting for artists, primarily strategic planning, and I have had this conversation with a number of clients. I had a client who named her studio something that had nothing to do with her name, but her work as a photographer was starting to get recognized. We discussed that she could keep her leather work and jewelry under the original studio name, but that as a photographer she should start using her name. She choose to do both, with separate websites for her different clientele. Second point that may help with women who have a name change as an artist – when you do a name change, that is a really good time to contact your past clients, galleries in which you’ve shown, all the names you have collected over the years to 1) tell about your name change, and 2) to invite people to take a look at your new collection(s). This is actually a great time to reconnect! For those that have common names and/or long names, I feel your pain. I have a name similar to the comedienne, Kate McKinnon (I’m Kate MacKinnon). So, for my business, I went with KF Mac Consulting, with my actual name directly under my business name. When people say “I’ve heard of you,” I never know whether it’s my marketing efforts, or whether they’re vaguely aware of the name of the woman on SNL. In general, I pose the question to my clients like this: “If you are in a publication, how do you most want to be recognized (i.e. by your studio name or your actual name/riff on your actual name?” For artists in the fine art category, I usually suggest using their name/riff on name. If it is an artist who works in multiple mediums and/or produces art in a more whimsical style, than he/she can use a name that relates to the theme of their work across the different mediums. If both, one can have two separate names/websites under the same business. When it comes down to it, it’s about the connections you make to those who purchase your work. Let me put it another way, you are the only one who will be concerned with the name under which you will do business. Everyone else will just accept whatever name you choose. Let’s face it – Google isn’t the greatest of names – it was awkward, a spelling mistake, and most folks don’t know where it comes from, but, we all know the name, and the name of the company doesn’t keep us up at night. Thank you for the post, Jason of Xanadu Galleries! (I love the name Xanadu, and it reminds me of Coleridge – “that stately pleasure dome decree.”).